Volunteer Sarah Partridge helps out at a foodbank [Image: Rowan Griffiths]. Fat chance of that happening. Jacob Rees-Mogg has never done a day’s hard work in his life. 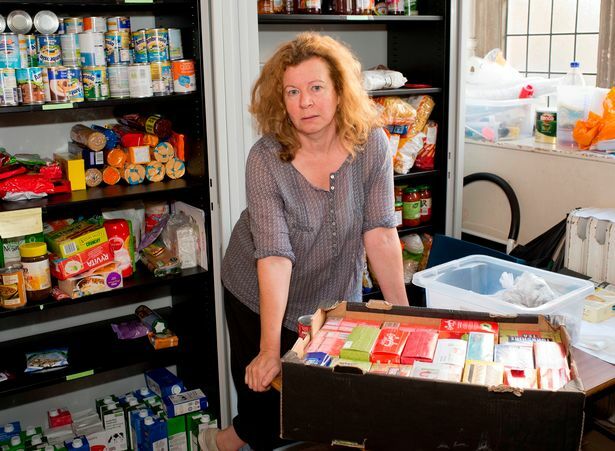 The challenge from a food bank in Bath comes after This Site reported on a food bank in Cornwall, where volunteers said they knew children were starving but they could do nothing about it because they didn’t have the resources. It happened at the same time as Mr Rees-Mogg appeared on LBC radio to say food banks were an “uplifting” phenomenon, showing the charitable nature of UK citizens, and filling the gaps where government could not provide. The point, of course, is that food banks do not have enough and cannot fill those gaps. People are starving because of government policy and people like Mr Rees-Mogg are mouthing platitudes about it while looking the other way. This Writer agrees with Sarah Partridge of the Bath food bank. A shift as a food bank volunteer would do him a power of good. A stint as a food bank user would be far more educational, though. Foodbank workers in Somerset [have] challenged MP Jacob Rees-Mogg to do a shift with them to witness the reality of their work. Volunteers at the foodbank in … Bath can see over 20 people a day. Rees Mogg is a devious and dishonest individual. He said “the government could not provide”, when what he should have said is, “the government refuses to provide.” It may seem pedantic, but it is important that odious individuals like Rees Mogg are challenged on their false interpretations of fact. I really can’t see him taking up the challenge to do a day’s work in any Foodbank – or anywhere else for that matter. He much prefers to sleep on the House of Commons benches. Not work in one make the bast*rd dependant on one for the rest of his life. the only way anyone will get any of these conservative MPs to visit let alone work in one is to kidnap them. blindfold n handcuff them till they get to a food bank, then handcuff one hand to a table leg after being taken around the place n shown just how much food etc theyve got, then how a food bank works then told to listen to the stories of those having to use them and ACTUALLY TALK TO THOSE PEOPLE. of course this is not a good idea being as it is illegal and the tory sceptics know this. He certainly should do a shift in a food bank to give him some perspective. He wont though because ‘work’ and ‘poor people’ are beneath him.